Shirts With Random Triangles: Oklahoma St. adds Houston safety prospect Kenneth McGruder to its 2015 recruiting class. 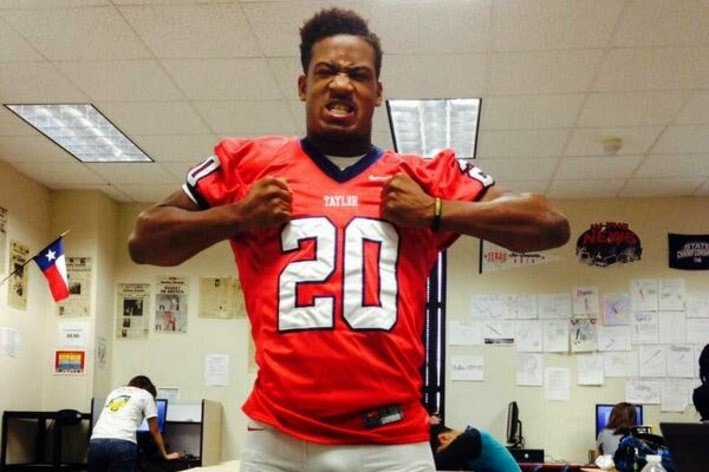 Oklahoma St. adds Houston safety prospect Kenneth McGruder to its 2015 recruiting class. Kenneth McGruder. Photo via Cowboys Ride for Free. Oklahoma State has added a seventh prospect to its 2015 recruiting class. Houston, Tx safety Kenneth McGruder made his commitment to the Cowboys' recruiting class of 2015 on Wednesday. This is McGruder's announcement on Twitter of his commitment. Here are McGruder's intangibles according to Rivals.com. McGruder is graded as a three-star safety by Rivals.com. He is the ranked as the 75th best prospect in the state of Texas. He is also ranked as the 37th-best prospect at safety in the U.S.
McGruder attends Alief Taylor High School in Houston, Tx. He stands 6'1, and weighs 209 lbs.